On the opposite side of the winding hole is an old stone building amidst a heap of ruins and rubble. This was once a Blacksmith's and Carpenter's shop. There was always plenty of work for both these trades in the canal heydays with horses regularly needing shoeing and boats often requiring urgent maintenance. The ruins of the Queen's Hotel on the right. On the towpath side of this area, where the present industrial buildings are located, was once the site of the Queen's Hotel. During the early 19th century this was a staging post for passenger boats travelling between Ashton and Marple and later also to Macclesfield. It was not unusual for the passengers to slip into the hotel for a quick drink whilst the horses were being changed and the Queen's did a good trade until traffic on the canals diminished due to the rise in popularity of rail travel. A packet boat full to the brim! 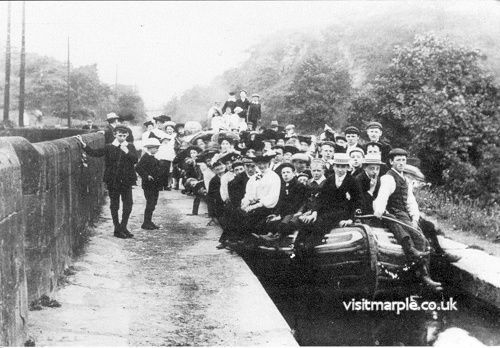 The superb picture above shows just how incredibly busy these so-called packet-boats were before the railways took over. 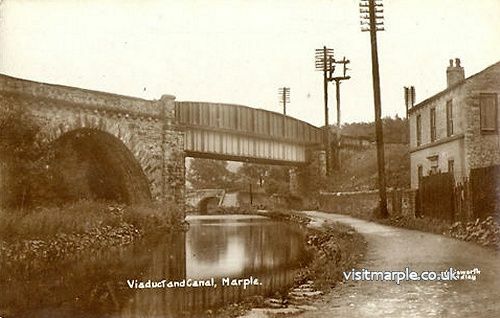 This is despite Joel Wainwright pointing out in his 'Memories of Marple' that it was often much quicker to walk! Before starting the steep climb through Marple's 16 locks, a journey that is likely to take around two hours, the boater next has to pass under Bridge No. 16. The Winding Hole - Jake Taylor.